Recently, our friends (and official Partners) at Igloo Studios released their Product Connect plugin for SketchUp. 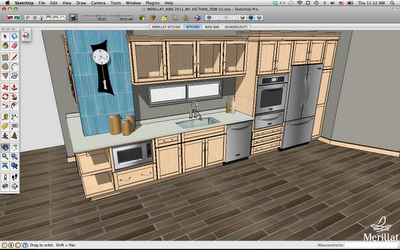 The plugin is designed to help you get more out of product models stored in the 3D Warehouse. 3D models which are “Product Connect-enabled” are rich with information; they can include SKUs, website links, dimensions and in some cases, pricing information and environmental statistics. 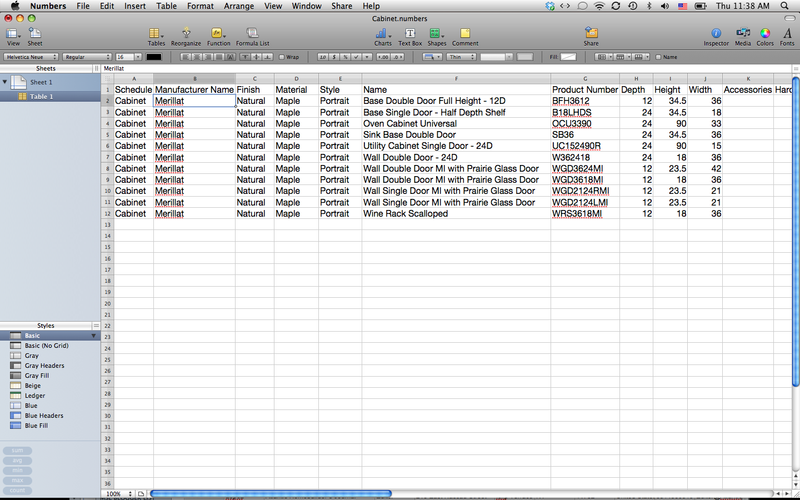 After adding these PC-enabled models to your SketchUp project, you can use the Product Connect plugin to export the metadata as an organized product schedule in the form of a spreadsheet. Igloo’s new offering makes going from conception to production a heck of a lot simpler. Download the Product Connect plugin from Igloo Studios website and install it on your machine. 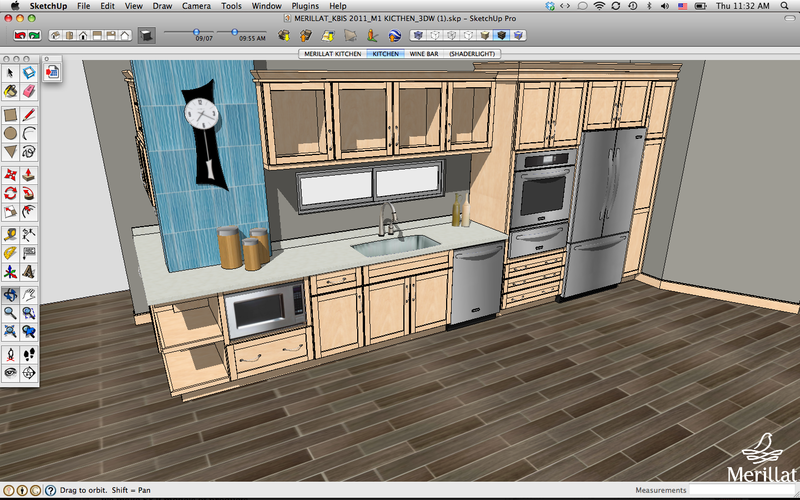 Find a Product Connect-compatible model in the 3D Warehouse and download it into your SketchUp model. 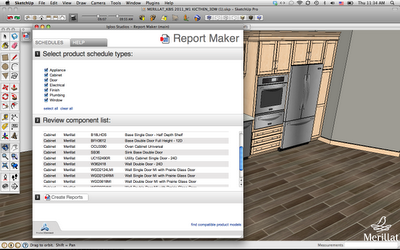 Open the Product Connect tool set and click Report Maker. 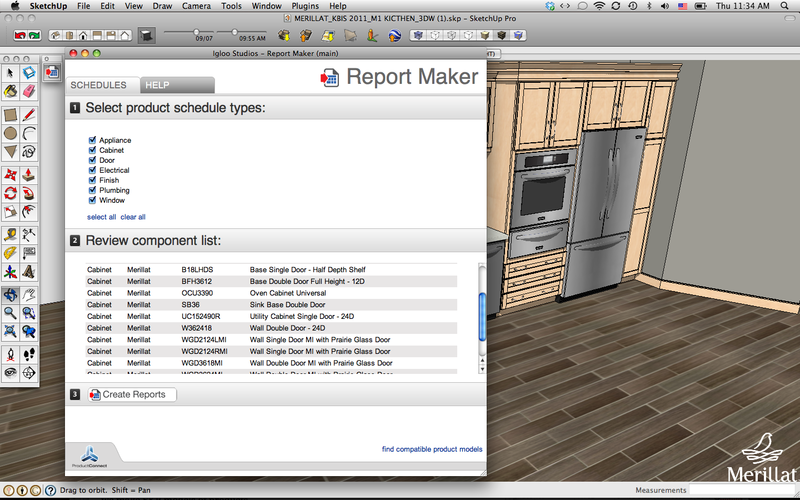 Select a product schedule type (such as Cabinet or Appliance), then click the Create Reports button. 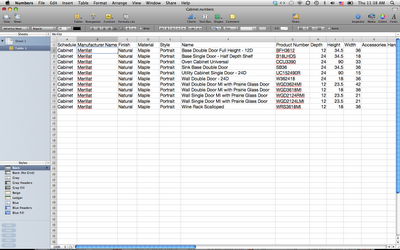 The plugin generates a spreadsheet containing all of the product models as well as their relevant metadata. Are you a product manufacturer who’d like to offer PC-enabled models on the 3D Warehouse? 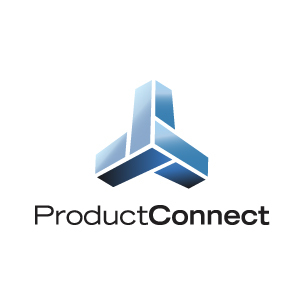 Any product manufacturer can participate by creating new Product Connect-enabled models or by upgrading existing SketchUp models to be compatible with this system. Awesome! Has anyone told Ikea about this yet? I agree with the comments above. The more who get involved the better!! I have to say you implemented my plugin concept,that emailed you about without so much as a free copy of your software (sketch up). I hate to say,you have money and have stolen from a smart guy with no job. So you,adobe,and ableton live have all done the same to me.